Update. 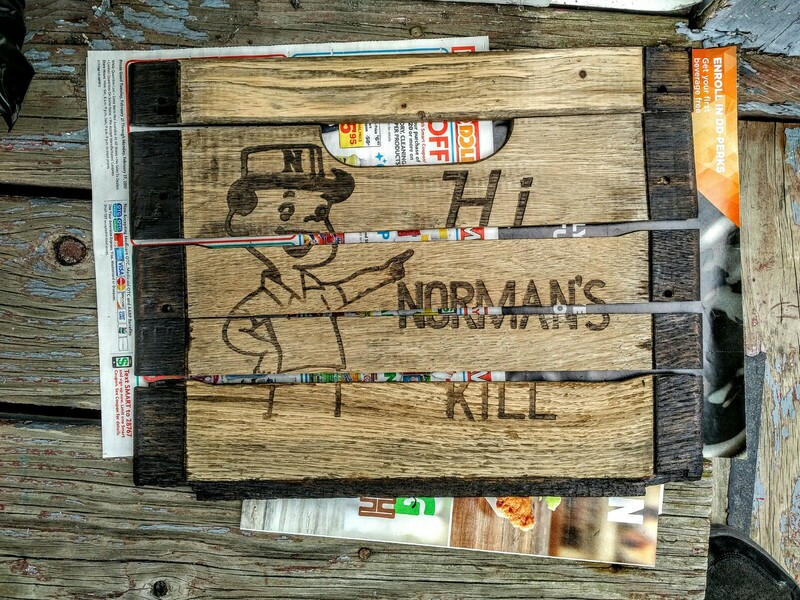 For the past couple of weeks, I’ve been working on turning an old wooden milk crate into a piece of waycool hanging art. I removed the oak slats from the crate, sanded them down to bring out the grain in the planks, and stained the edges of the planks with black stain. Now I’m not going to leave this bare wood just sitting there and aging. That’s not part of the project. I need to make this thing look awesome. And to achieve that goal, I’m employing some amber-colored shellac. 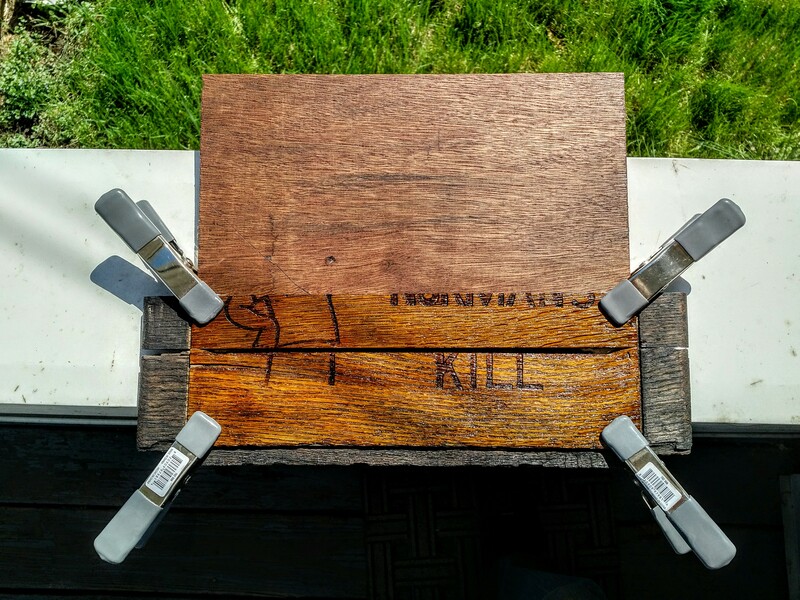 Two coats of this stuff on the five center planks – making sure to not extend the shellac to the black stained edges – and let dry. I chose amber-colored shellac to both protect the wood, and to make the wood grain pop like fireworks. So I’m just going to post this here … and wait until it dries and cures. 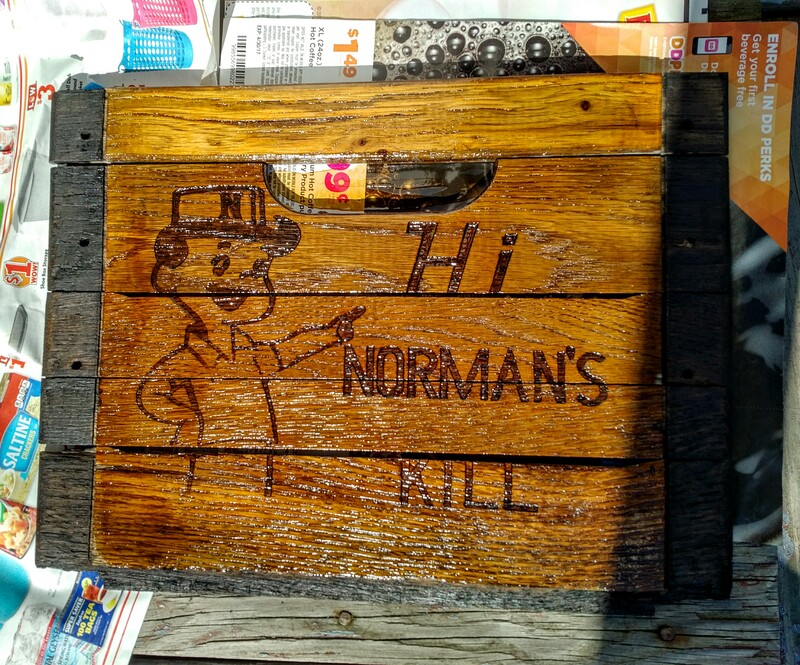 This is what two coats of amber shellac can do to 60-year-old wooden planks. Swank. After I finished shellacking the boards and letting them dry, I prepared the substrate. This was the 12″ x 10.5″ piece of scrap wood that Silver Fox Salvage gifted me for the project. Using some super-strong wood glue and some clamps, I applied the boards, one by one, onto the substrate. As the glue hardened and dried, I added more planks to the substrate and carefully re-clamped the pieces. I also made sure to re-align every single board so that the logo and lines all matched up. 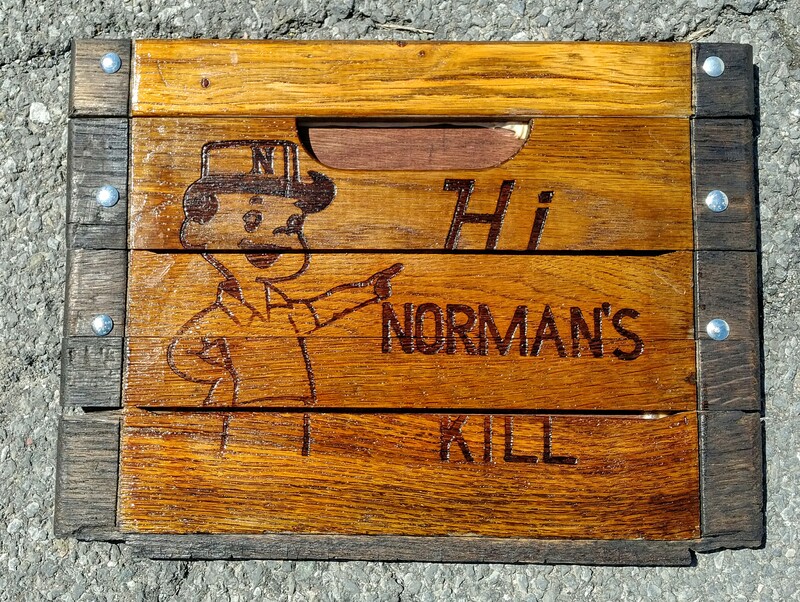 I even added an extra wipe and drop of shellac here and there to some bare spots in the wood. I should note that there were several holes in the edge portions of the slats – those were where the boards were riveted into the frame of the milk crate. Now rather than invest in rivets and a rivet gun and all that … I decided on a less expensive but just as elegant solution. Yep, I found the smallest diameter carriage bolts around – had to go to three different home supply stores to find them. I also picked up some matching nuts, along with some rounded nut caps (you screw those onto the tail end of the bolts). 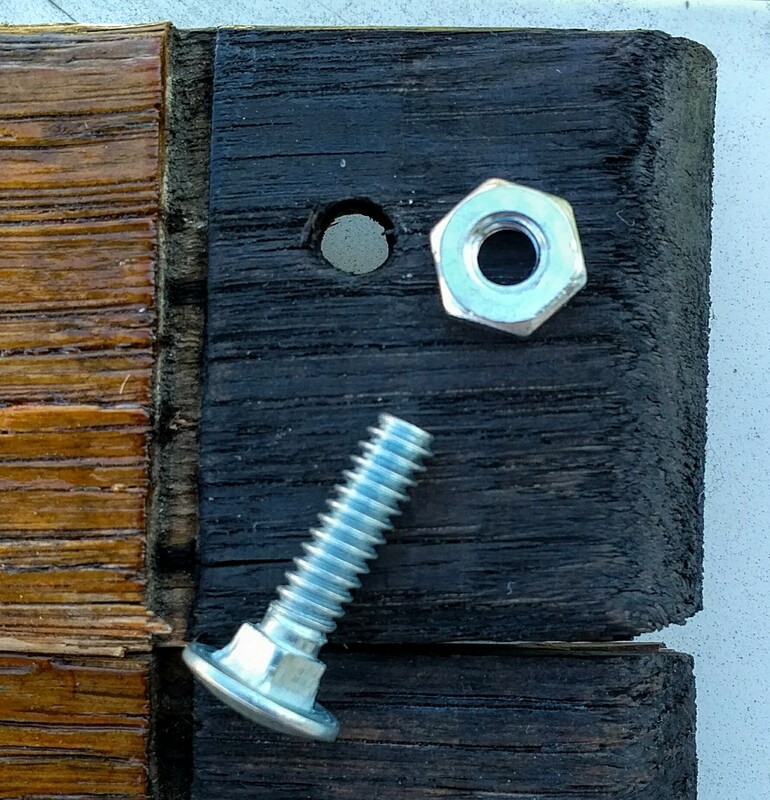 I threaded each carriage bolt into a hole, then screwed on the nut. I used a ratchet wrench to make sure the nuts and bolts were nice and tight, then added the rounded nut caps. All I need to do now is wire up the back and hang it on the wall. But yeah, this is what came out from my project. A little staining, a little shellacking, a little sanding, a little carriage-bolting … and this will make a nice decorative accessory for my living room or my home office. Wowies. My first completed art project on the new blog. You are a man of many talents! Nice job. Beautiful work! What a mind you have for creativity.